A great addition to any busy kitchen, the CDN IN1022 Infrared Gun Style Thermometer helps monitor surface temperatures. A safe and sanitary tool, this thermometer uses laser target illumination so it doesn't need to be inserted into food for it to function. Scientifically calibrated to provide an accuracy of + / - 4 degrees Fahrenheit, this thermometer has a temperature capacity of -76 to 1022 degrees Fahrenheit. For added convenience, this thermometer has a lock mode which allows you to continuously measure temperature for up to an hour while its data-hold and memory features retain previous readings. 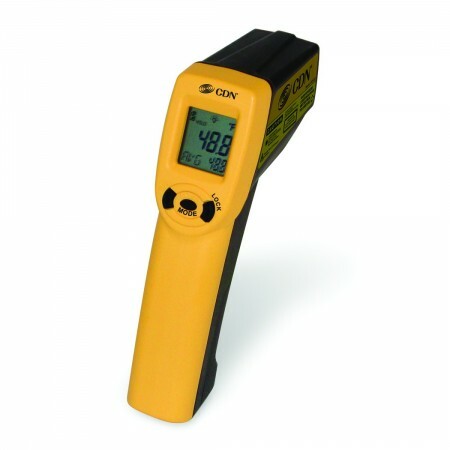 Thanks to its ABS plastic construction, this shatterproof infrared thermometer will withstand heavy duty use. Dimensions: 6" x 1-1/2" x 3-1/2"